If the modern superhero movie is defined by Marvel standards, a sense of humour with plenty of action and a dash of pathos is required and Aquaman has all of those. After the dark and bombastic Zack Snyder Superman and Batman movies plus the mixed reactions for Suicide Squad and Justice League that almost sunk the DCEU (DC Comics Extended Universe) the Aquaman film represents a further course correction after the surprise success of Wonder Woman (2017). Yes, the plot is kept light but the genuinely beautiful visuals and locations and some well judged editing and soundtrack choices maximise the charisma of titular lead actor Jason Momoa and his co-star Amber Heard, who plays Princess Mera. Aquaman is the half-human/half Atlantean who made his first appearance in Justice League (2017), recruited by Batman to help fight Steppenwolf, and his irreverent humour and blunt fighting style endeared him to fans enough to get his own movie green-lit. Aquaman’s origin story – as Arthur Curry – is thankfully kept brief in his own movie – but there some ecological points made during the world building and character relationships with an economy of dialogue as Aquaman goes from a gruff loner with decent values to embracing his destiny as the one true King of Atlantis. The threat here is from a Games Of Thrones styled plot by Arthur’s younger half brother – King Orm (Patrick Wilson) who is seeking to unite the various Atlantean tribes by underhand means to become Ocean Master and wage war on the surface world which has spent decades polluting the oceans with all manner of plastic and toxic garbage. The reluctant Curry must go back to Atlantis to claim the crown he never wanted to stop war with the surface where he lives. The script is a pleasing mix of Indiana Jones and Guardians of the Galaxy crossed with the aforementioned Game of Thrones but what’s impressive about it is that it mostly makes sense, especially in the final act where a final battle could get confusing – especially in a film about a little known hero. 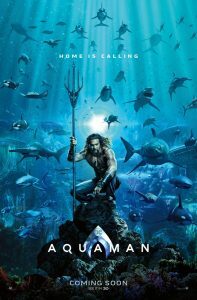 James Wan’s unusual horror-inflected direction ensures that each plot point isn’t belaboured, and some well chosen A-class co-stars in Willem Defoe (Aquaman’s mentor Vulko) and Nicole Kidman (Queen Atlanna) add quality to proceedings while Patrick Wilson (King Orm) makes for a memorable antagonist with some backstory. There’s a lot less subtlety with Orm’s right-hand man – a major DC villain called Black Manta – whose motivation to kill Aquaman was a little overplayed. These things hardly matter though as many people will be thrilled by the action sequences – and Aquaman doesn’t disappoint in that respect. It’s just nice to see some new talent getting involved in the superhero genre and making a good fist of it – this entertaining film will stand up to rewatching very easily. The DCEU movies have generally avoided post credits scenes – only Justice League has one – but Aquaman has a mid credits scene so it’s not a very long wait to see a bit extra which might give a clue to a possible sequel. Coming up soon is more comedy in Shazam (starring Zachary Levi) in April, and then a Joker movie (starring Joaquin Phoenix) in October, then a Harley Quinn movie (starring Margot Robbie) in February 2020, while the long awaited Wonder Woman 1984 has been bumped to June 2020. Summary: AQUAMAN is a superhero action film in which the heir to the throne of the undersea kingdom of Atlantis tries to unite the land and sea kingdoms.